When Ireen Sakala, a smallholder farmer in Mkanda Chiefdom, heard about a new effort to document land ownership, she feared that as a disabled, single woman, she might be excluded. Confined to a wheelchair since childhood and unable to find employment, Ireen depends on land inherited from her parents for her family’s livelihood. Her land, like most rural land in Zambia, has no documentation and is administered through inheritance from family and verbal histories under the authority of a village headperson and the chief. With a growing population and increased land scarcity, pressures on property rights and land security are rising. 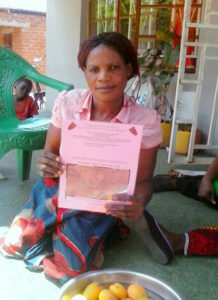 Elected as the Secretary of the Village Land Committee, Ireen has now undertaken a leadership role administering the village land register to help others in her community access the same rights she has gained. Working with organizations such as the CDLA, Zambia’s traditional leaders and government are recognizing the benefits of strengthening community and household land rights. With over three-quarters of Zambia’s land falling under customary tenure, leadership and support from chiefs and chieftainesses creates optimism for the future in farmers like Ireen.